Aerial view of Jack and Lola Graham house; Mt. 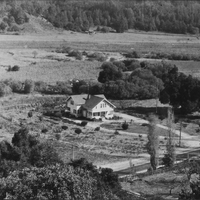 Hermon Road; Skypark Airport under construction; site of former Locke Mansion, later Holmes and Hannigan Saw Mill. 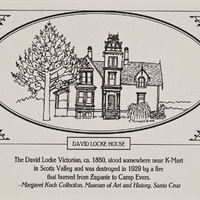 Drawing of David Locke House located on Mount Hermon Road, Scotts Valley, Calif. 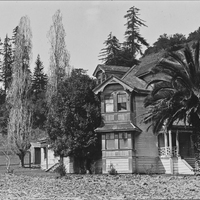 The Marion Hollins Groom's House at Hollins Polo Barn in 1930. 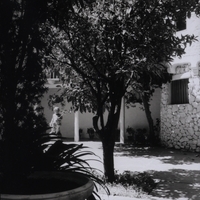 In 1935 the stables belonged to the Law family; named ""Lawridge Farms."" Thompson - Frapwell Mansion. 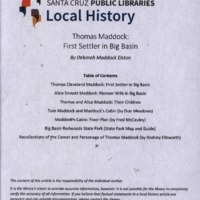 West side of Los Gatos - Santa Cruz Highway, Scotts Valley. It had 19 rooms. 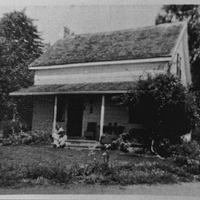 Built 1886, it was torn down in the 1980's. 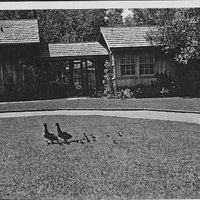 Edward and Elva Frapwell's home and yard. It was built 1921-1923 and occupied 1923. 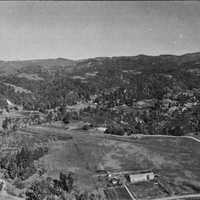 View from western hill looking southeast, with Old Los Gatos - Santa Cruz Highway in foreground. 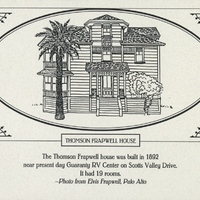 Drawing of Thompson Frapwell House from Elvis Frapwell's photo; house was built in 1892 and had 19 rooms.